Continues through October 4 at Bohemian Grove, 64 Grove St., Bushwick. Opening performances at 8pm, play at 9pm. Tickets are $10 at the door. More info here. 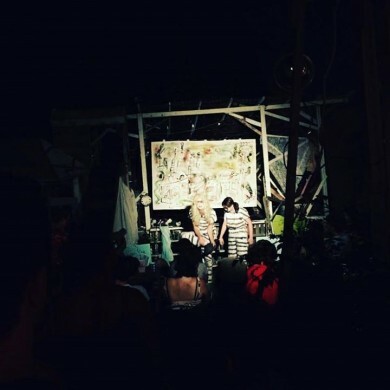 Bushwick DIY basement venue Bohemian Grove steps into the world of the stage with Saints Of An Unnamed Country’s “no-brow” tale of two clowns stranded on a beach at the world’s edge, debating the finer philosophical points of life. Literal and metaphorical jail will be the topic of the evening in a piece that aims to break free from conventional chains. Knowing the folks at the Grove, they’ve already thrown convention to the side. The show’s four-day run also features a different opening and closing act each time, peppering this oddball evening of theater with music, comedy, and performance art. “_Jailbreak!_”*tm is written by Seraphic Romance Rots Truth and Cameron Christopher Stuart, with sound and set design by Dean Anthony Cercone Jr. Featuring Lily Chambers, Cameron Stuart, and Rebecca Richards. Continues every Friday until October 16 at The Annoyance Theatre, 367 Bedford Avenue, Williamsburg. 8pm. Tickets are $8 and can be purchased here. “A disgusting journey through your unholy human flesh prison” is coming to Williamsburg experimental comedy theater The Annoyance. This wacky and delightfully daring show may feature an alien, but don’t worry, you’re not in danger of being probed. Instead, you’ll watch two naked people learn about their bodies in a world that seems an awful lot like our own, but with a lot more hot dogs. You’ll understand when you see the show. Or, maybe you won’t. Previously performed at Over the Eight, this skin-filled spectacular is back, with fine-tuning from director Jo Firestone. 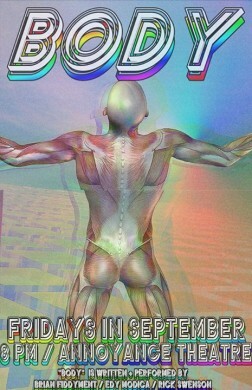 BODY is written and performed by Brian Fiddyment, Edy Modica, and Rick Swenson. Directed by Jo Firestone. Featuring Steven DeSiena. Continues through October 18 at Soho Rep, 46 Walker Street, Tribeca. 8pm, some performances at 5pm. Tickets are $25 and can be purchased here. The award-winning moguls of “serious make believe” at Pipeline Theatre Company have set up shop at Soho Rep with The Gray Man, a new play by Andrew Farmer. It’s a haunting reinterpretation of the classic boogeyman tale set in a New York tenement house, set to an original musical score. As a member of improv troupe Gentlemen Party, Farmer is quite skilled at larger-than-life comedy, but with this show he proves that he is just as good at serious scares. Recently opened, The Gray Man has already received critical acclaim for its ability to be both compelling and horrifying. What better way to get in the mood for the rapidly-approaching Halloween? The Gray Man is written by Andrew Farmer and directed by Andrew Niesler with music by Chris Ryan and Mike Brun, set design by Andy Yanni, costume design by Daniel Dabdoub, lighting design by Christopher Bowser, props by Jess Adams, and sound design by Josh Millican. 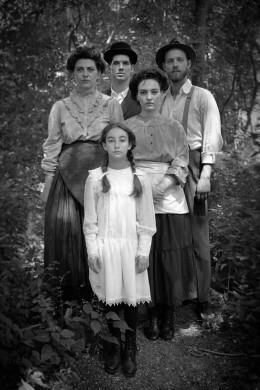 Featuring Daniel Johnsen, Tahlia Ellie, Katharine Lorraine, Claire Rothrock, and Shane Ziegler. At Joe’s Pub, 425 Lafayette Street, East Village. 9pm. Tickets are $25 and can be purchased here. Mx Justin Vivian Bond is non-binary cabaret royalty, a figurehead of the downtown queer performance scene. Joe’s Pub kicks off a yearlong retrospective of Mx Bond’s work and 25-year performance career with this revival of v’s debut cabaret show. 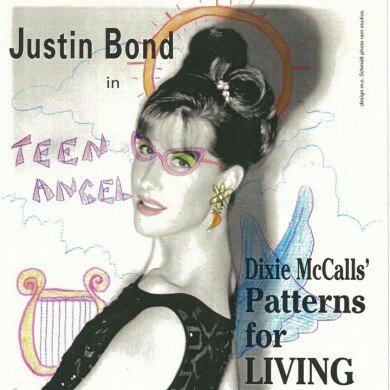 Originally performed in San Francisco in 1990, Dixie was born out of Bond’s interest in actress Julie London. It was v’s first work with longtime collaborator Kenny Mellman and laid the foundation for their act Kiki and Herb, which is being brought back to Joe’s Pub Spring 2016. Come experience the works and artists that boldly paved the way for the thriving alt-cabaret scene so frequently seen at Joe’s Pub today.